There is no wind today, and we are sitting at 79% humidity. I usually wait for windy days to hang out our whites, or put the drying racks over heat vents indoors in the winter to release the wrinkles. The weather isn’t supposed to be laundry-friendly until Friday though, and I’m determined to have a labourless Labour Day weekend! Do I plug in a fan? Or would the iron use less hydro? 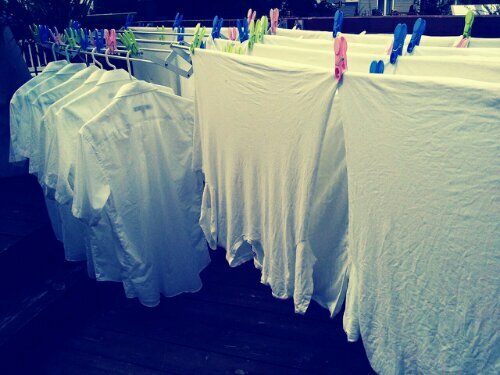 Life without a dryer doesn’t mean we have to live with wrinkles …. we simply use a bit more liquid fabric softener and some creativity. I’m hoping the humidity will help; stay tuned!